« Happy Birthday, Isaac Asimov! 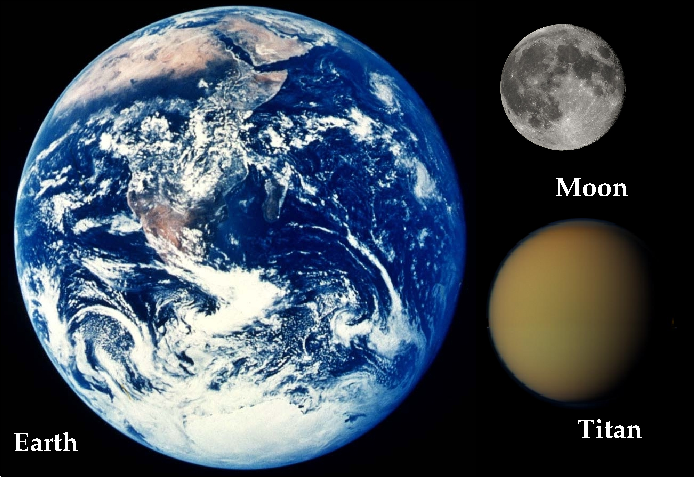 Titan compared with Earth and the Moon. Titan is the second-largest moon in the Solar System, larger than our Moon and the planet Mercury. ‘Tis the New Year (in the Gregorian calendar, at least)! Over the weekend, the twin GRAIL satellites entered orbit around Earth’s Moon, and I may yet have something to write about that very cool mission, but first I want to highlight the largest Saturnian moon: Titan. (Other Moonday posts cover Hyperion, Enceladus, Io, Europa, and our own Moon.) Titan is the second-largest moon in our Solar System; with a diameter about 40% of Earth’s, it is significantly larger than the Moon and slightly larger than the smallest planet Mercury. Here are some beautiful pictures from the recent Cassini flyby of the moon. 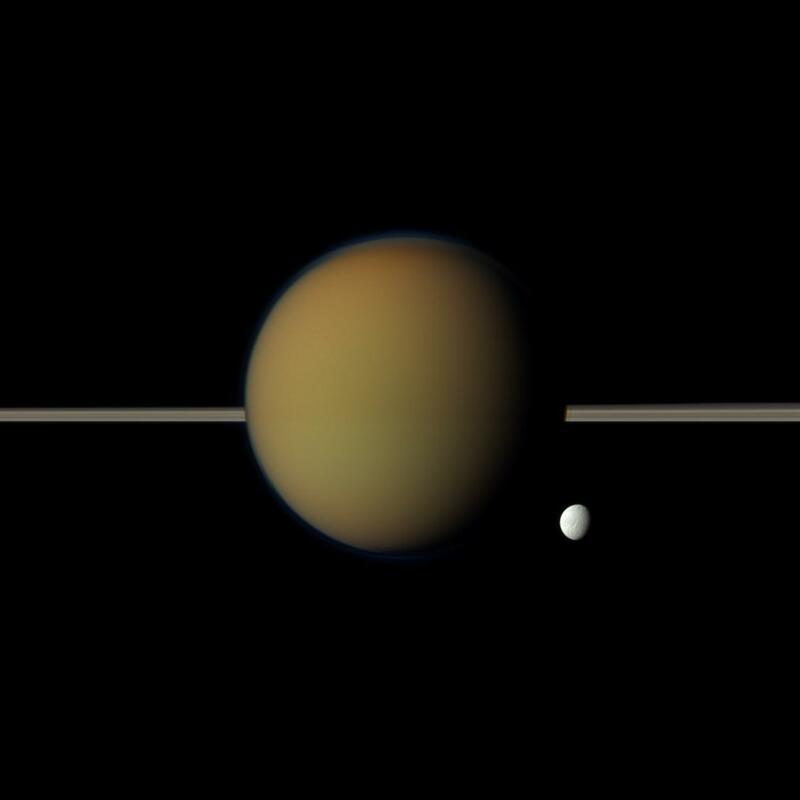 Saturn's largest moon, Titan, along with icy moon Tethys and Saturn's rings. Note how hazy Titan's atmosphere is; some of the same chemicals are present in smog on Earth. Titan is unique in the Solar System: it has a thick atmosphere where other moons have at most a thin exosphere, a tenuous layer that isn’t even visible in most images. Titan’s atmosphere, like Earth’s, is mostly nitrogen, but the resemblance doesn’t go much farther than that. The image on the right shows Titan to be a hazy orange color, caused by methane and other hydrocarbons: compounds of carbon and hydrogen such as ethane, propane, and others. Many of these molecules are also present in smog on Earth, so that a pollutant here occurs naturally there. Titan’s atmosphere is both thicker and heavier than Earth’s, with a surface pressure about 1.5 times that at sea level on Earth. The surface of Titan, as photographed by the Huygens lander. Much of the surface contains water ice, hard as mineral-based rocks on Earth. Don’t look for oceans of water on Titan, though: the moon has always been much colder than Earth, lying well outside the habitable zone. 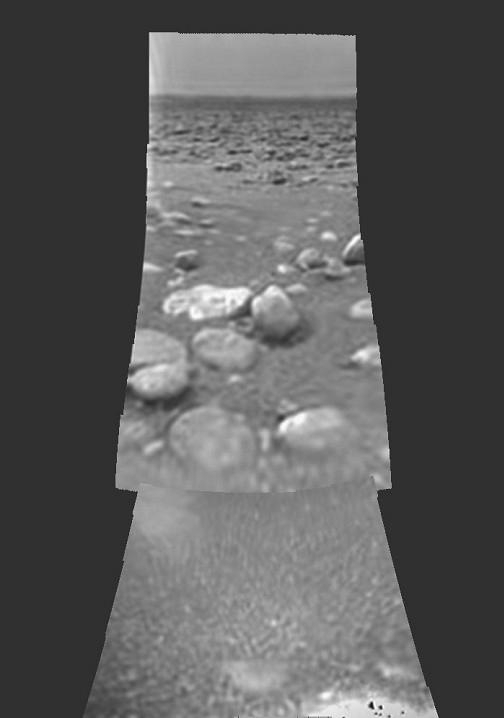 What ice there is on the surface is part of the rocky terrain, as photographed (with extreme difficulty, since the atmosphere is not very transparent) by the Huygens lander in 2005. Though Titan is tidally-locked to Saturn so that it presents the same face to the planet all the time (like the Moon and many of the other moons in the Solar System), it’s significantly farther out than Enceladus, so tidal heating of the interior is less significant. Several different models proposed by astronomers argue that Titan has a liquid interior, much like Enceladus or Europa. Methane lakes on Titan, as imaged by Cassini using infrared light. Kraken Mare is the dark region at the very top of the image; click for more information. Nevertheless, liquid seas do exist on Titan, but they’re made of methane and ethane instead of water. Simply having liquid on the surface makes Titan special, though, since only Earth shares that characteristic among the known worlds in our Solar System. (I’m hedging because Pluto or other Kuiper belt objects might have liquid seas, but they are too far and small for our telescopes to resolve currently. The New Horizons probe, which will arrive at Pluto in 2015, should provide part of the answer.) Though the total surface coverage isn’t as much as on Earth, some of the methane lakes are quite large, including one wonderfully named Kraken Mare. Again, we are left with the conundrum: what does “Earthlike” really mean? I found myself pondering that as I read up on Titan today; while the moon isn’t particularly like our home, it’s one of the few worlds that shares more than one feature. If it truly resembles our infant planet, further exploration will reveal much about our own past, and again may help us answer questions about life’s origins.